Is living the life of your dreams really possible? It's not only possible, but it's quite predictable when you discover the way success works! 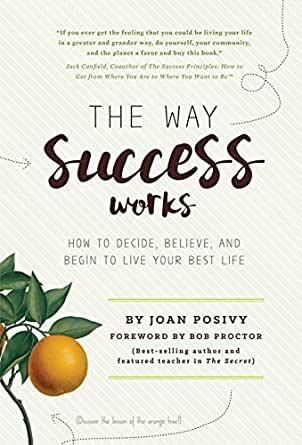 Whether you're 18 or 88, author Joan Posivy will not only convince you that you are quite capable of living your dream life, she'll share with you a set of very clear and concise steps of how anyone who is eager to stand up, jump forward, and count themselves in can follow. To where? To living your best life! You'll be inspired and motivated by success stories of young adults from around the world including a break-dancer from Australia, a mountain filmmaker from New York, a Scottish jam enthusiast, a big-hearted restaurateur, and many more featured in this radical, revolutionary new book. "These stories," as Jack Canfield explains, "totally inspired me and inspired my sons to take it to the next level." You'll be forever empowered by the deepening understanding you gain in knowing you can create an extraordinary life. Buy The Way Success Works now and begin immediately to create your best life. "This is a remarkable book, full of captivating stories and inspiring examples of young people achieving amazing things by having the courage to follow their dreams. As a former professional youth leader, I have long since come to realise that, no matter what direction our lives take, we all need the right tools and the right mind set to help us achieve success. Joan's book is packed with everything you will need to live the life of your dreams. Follow it carefully. I only wish I had such a wonderful guide when I was starting out." "This book is the culmination of years of experience spent learning what works if you want to wake up feeling good about your life and looking forward to your day. This uplifting account will be of benefit not only to young people who are just starting out but also to people of any age who want to live their best life. Take from the wealth of information provided...There is no down side." - Judy Oleniuk, Ph.D. This book will change your life. Joan Posivy has found the recipe for success and she shares it with you in this book. Throughout this amazing guide to success, Joan relates every topic to her reader in terms that anyone can understand. She single handedly brings the world of the entrepreneur to the forefront of the conversation, pointing out that anyone can accomplish their dreams, if only they have the tools necessary. I highly recommend this reading for anyone, during any part of their lives. The lessons taught throughout this guide will revolutionize the way you view yourself and the world. You will immediately notice a heightened awareness of and care for yourself and the world around you, which will enable you to take full advantage of opportunities and possibilities as they are presented to you. Joan has created a genius piece of work, one that relates to, and supports, the current generation of young leaders. This book will undoubtedly change the way you live -- and you won't ever want to go back. Hey all you Jack Canfield and Marci Shimoff fans out there-- I've got a recommendation for your next book to read! The Way Success Works is a great fun read that you won't be able to put down. The warm tone makes the book accessible, and the actionable advice makes the book meaningful. This book just might change your life-- don't miss out. There are not enough books out there to teach young adults about an outlook on life it took me many years to learn. Thankfully, there are books like these to give our youths to put great ideas in vs drama and graphic violence. Excellent book. Easy and interesting read. I was worried about all the talk of "youth" in the comments. I'm not a "youth" and I thought this might be alienating, but it was not. Great examples, great starter book. I will be sharing with friends. The road to success is not a straight line. For most of us it offers many options. Some paths are hard work, struggle and persistence. Other are blessed with an easy route of crazy talent, influential friends or gifted by wealth. In her book, Ms. Posivy shows us simple steps and plans to achieve success. The ideas in this book can help to make your journey fun, faster and possibly more enlightening to those you meet along your path.